The past few days have been the coldest we've had all winter which has meant lots of soup, lots of hot chocolate, lots of snuggles and hours of The Office. 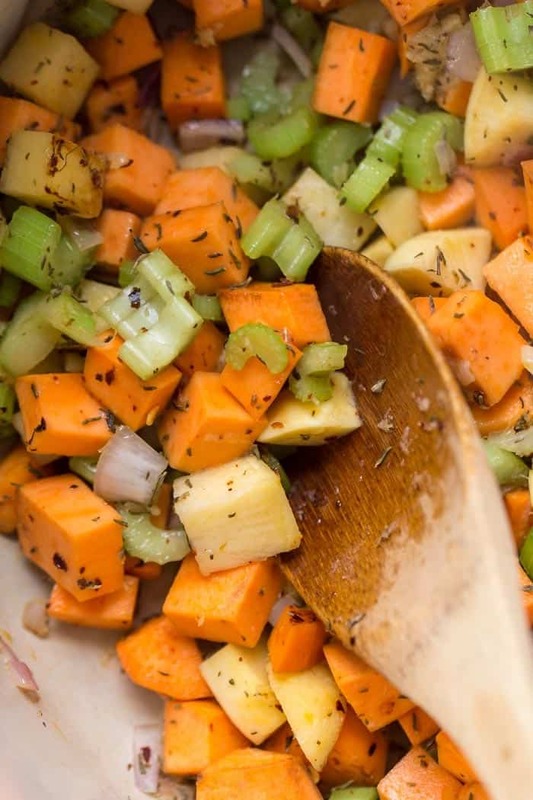 I do feel like the term “detox” has a bad connotation in the health world, but we're calling this a detox-friendly soup because it's packed with ingredients that support your body's natural detoxification system. You see, our bodies are pretty darn amazing (if you didn't already know). We have systems inside of us that naturally flush out unwanted junk that we're consuming. Our body knows what it's doing, but that doesn't mean we can't help it do its job even better, right? 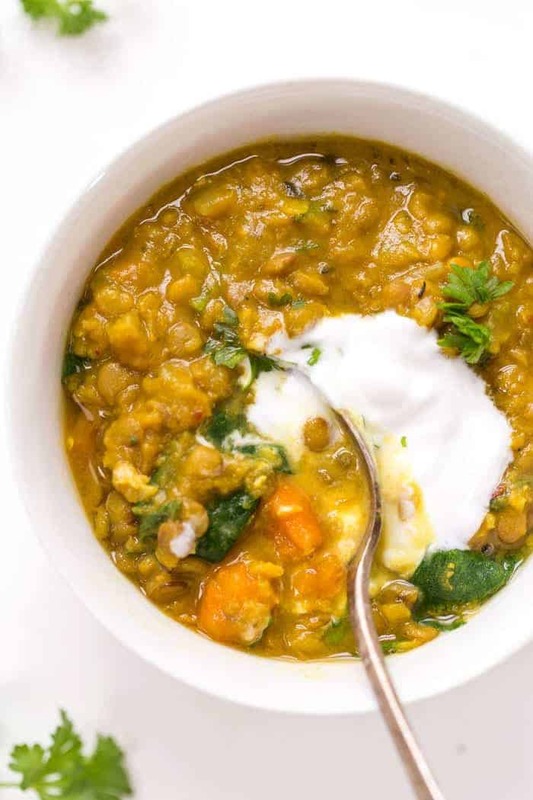 So that's what we're doing with this Detox Turmeric Lentil Soup. We're supporting our body with wholesome, nutrient-dense food that will make us feel amazing! 1. 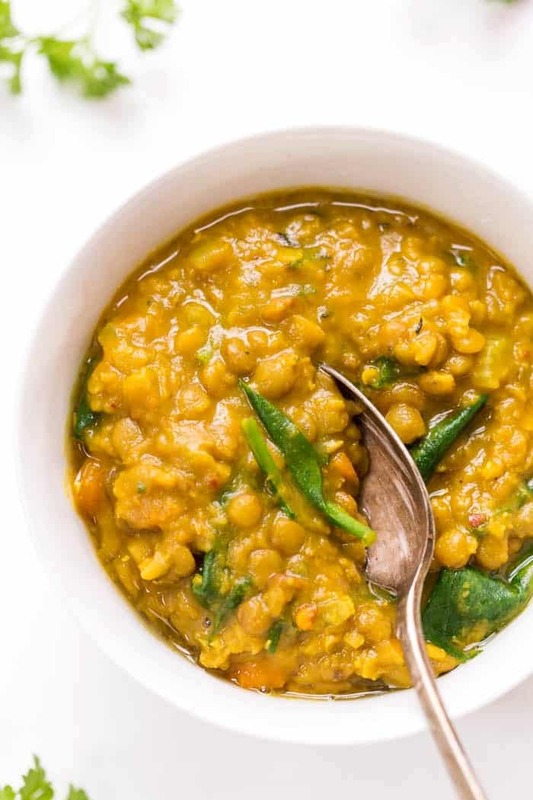 Lentils: not only are they super high in protein (11g per serving), but they're also high in fiber which is important for our digestive system. 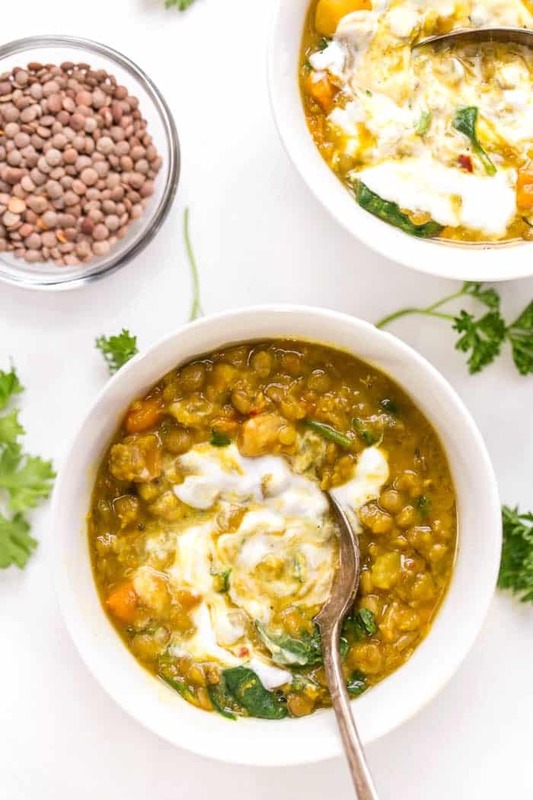 Our digestive system is responsible for absorbing the good nutrients in our food and getting rid of the unwanted waste, so when we eat food (like lentils), we're helping our digestive system doing its job more effectively. PS: check out this post for 10 reasons why lentils are amazing! 2. Turmeric: the active component in turmeric that is so great for detox (and gives it that amazing golden color) is curcumin. Curcumin has been shown to not only help reduce inflammation, but also support, and even enhance, the production of bile in the gallbladder. Bile not only helps the liver flush out toxins, but it also rejuvenates liver cells! 3. Sweet Potato: one of the things we love about sweet potatoes, aside from their flavor, is how high they are in fiber! Again that supports our digestive system, but fiber is also key for the liver. One more reason to love sweet potatoes? They're also high in antioxidants which helps to liver do its thang! 4. Garlic: these little cloves of goodness aren't just there to flavor our food! Garlic has also been shown to have healing properties including supporting a healthy immune system. But in terms of detox, garlic is super high in Vitamin C and antioxidants, both of which help support the liver and kidneys as they are working to flush toxins from our bodies! 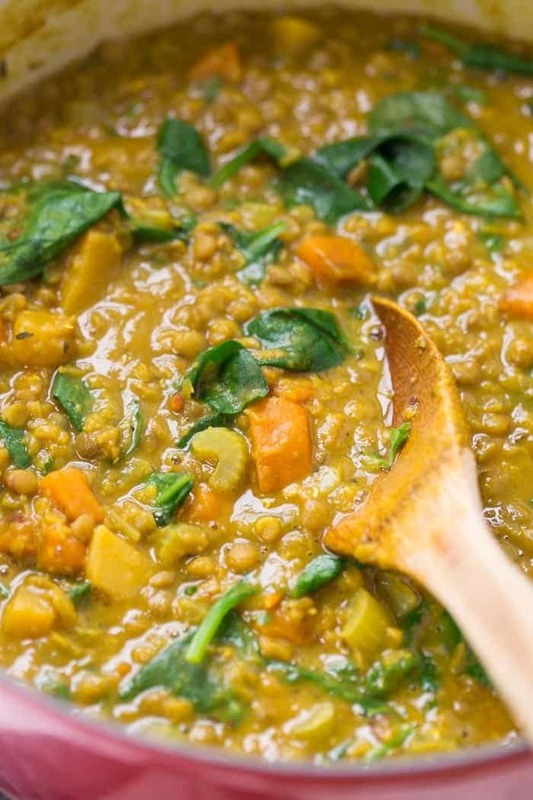 And these are just a few of the amazing ingredients in this turmeric lentil soup! I can't wait for you to try this soup! Not only is it cozy and hearty, but it's also super high in protein and fiber, and has a gorgeous yellow color. It's a show stopper if you ask me! It's also perfect for a crowd (football season anyone!? ), but can definitely be used for a healthy meal prep option for lunch or dinner. 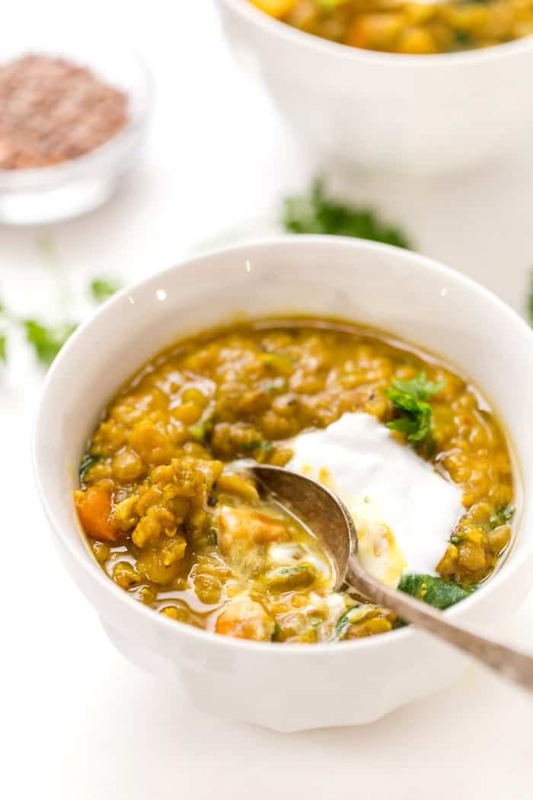 This soup freezes well, lasts in the fridge for at least 4 – 5 days and tastes amazing with a dollop of coconut yogurt on top! Not to mention it's…gluten-free, dairy-free and vegan! 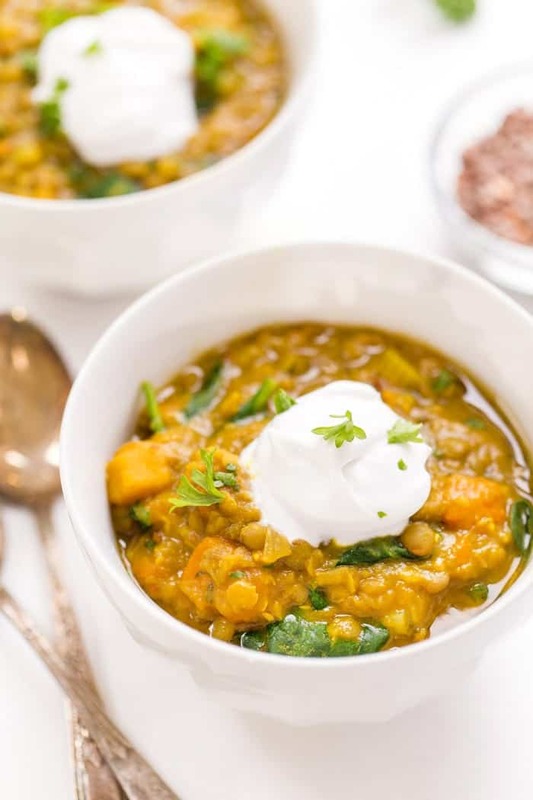 So whether you're craving something warm and hearty, or you feel like you want to give your system a little break, this golden turmeric lentil soup checks all those boxes and more! If you end up making this recipe, make sure to share a photo with me on Instagram ❤️ you can tag @simplyquinoa or use #simplyquinoa! Probably about 1 1/2 cups! Can you cook this in the instapot? I don’t see why not! I haven’t tested it, so not sure on timing! 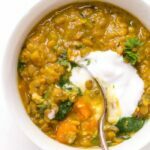 Detox Tumeric Lentil Soup. I watched your video for the recipe and you used three ingredients in the video that are not in your ingredient list—crushed red pepper, lemon juice, and coconut yogurt. I get the yogurt I s robably a spoonful, for each bowl, but how much crushed red pepper and lemon juice? Once made, can this be stored in the fridge and if so, for how long? Can it be froze as well? I’m so so glad!! Love that you served them with the zucchini fritters, they’re the best! Can this be made in a crockpot?? Looks amazing! I don’t see why not! 🙂 I’d say just like a chili – maybe 6 – 7 hours on low! Hi!! How much lemon juice should I add?! And did you use turmeric powder? Thanks!! Going to make this soon! How much lemon juice do I use? I would say a tablespoon is good! Oh no! I haven’t heard that at all, so honestly, I’m not entirely sure 🙁 Maybe there was too much turmeric? Or perhaps your lentils were bad? Honestly, there’s nothing in this recipe that should be bitter. If anything, I’d say it would air on the sweet side because of the sweet potato. Maybe test out cooking your brown lentils on their own and see how they taste? And definitely, the red lentils will help next time! This soup looks delicious! Does leaving out the almond milk affect flavour much? This is so good! I subbed carrots in place of turnips and regular potatoes instead of sweet because that’s what I had on hand . Also topped with hummus . Such a nice hearty soup ! Came across ur website by fb post & so glad I did! Made this soup tn with cpl twerks I used fresh thyme, ginger. 1% milk. Wow! How can something this tastey be so good for u. Definitely going to make this again! This looks delicius, this works for 6 servings.. if i do half of each item can it work for only 2 ppl..
P.S. I meant to tell you in my previous email that I have been scouring the internet for days, looking for the right recipes for my needs, such as gluten free, vegetarian, and many allergies. I just didn’t find what I was looking for until I found your website. I discovered recipes here for everything that I was looking for, and more!! This is a wonderful website! Thank you for all of the time and effort that you have put into your website. It is going to make a big difference in my diet. There are so many recipes here that I want to make! I’m excited about cooking and baking again. Thank you so much!! Could I make this in a slow cooker, and if so, how long should I cook it? Should I cook it on high or low? I can’t wait to make this beautiful soup! I am so happy to find your website. 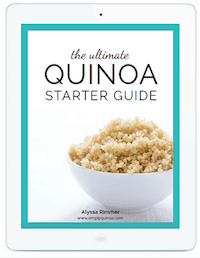 I can’t tolerate any grains, but since Quinoa is a seed, I can tolerate it. These recipes are fantastic. It is definitely going to take my diet to a new level. Thank you so much!! Do you have any suggestions for using all water instead of broth? Like what seasonings should I increase to keep flavor. I don’t want too much sodium. I have to keep my blood pressure normal. In some of the pictures of this soup, there is a white topping–did you put sour cream on the top? or greek yogurt? Or something else? than just reducing salt amount in recipe. Thank you. This was delicious. My whole family enjoyed it. Just wanted to say thanks I enjoy reading your articles and recipes and watching your videos.you are truelly an inspiration. Yay!! One of my absolute favorites as well 🙂 I’m glad it was a hit! I wanted to let you know this soup is fantastic. Hubby and I are getting older, and poor diet and lifestyle choices made in youth are catching up with us. We both have fatty liver, and so in my search for a healthy, liver friendly meal we both will enjoy, I found this recipe. I’ve never had lentils before and must say I really enjoyed them. Thank you for the wonderful soup! I look forward to trying some of your other recipes. I’m so glad that you’re enjoying it! I hope you find other recipes to try! Hi Alyssa! I was just wondering if a lot of flavor would be lost if I used all water instead of broth? Let me know your thoughts! Thank you! I think some would be lost definitely, but not all! I finally got to make this soup and it was so delicious! I followed the recipe exactly and my husband said it’s now one of his favorite soups! Thanks! Yay!! Love when the husbands enjoy the healthy meals as well 🙂 total win! So delicious! I used coconut milk as well. Had some turmeric root so I used that as well as powdered. Definitely a remaker. Oh yum!! So glad you liked it! Do you need to soak the lentils first? I never do, but I suppose you could! The soup was delicious but we did have to add about 2x the amount of seasonings. I put exactly what it called for, measured out everything; lentils, potatoes, spices, etc., but it tasted extremely bland. I would use this recipe again but would also keep in mind that it needs a good bit more of spices. Very nice. I substituted almond milk with coconut milk and I added some fresh vietnamese mint (has a similarish flavour to coriander). I used 1 1/2 tbl spoons of tumeric and it was a bit over powering. Next time I will reduce that to less than a tablespoon, add a bit extra ginger and maybe some fresh chilli to give it an extra kick. Oh yum! That sounds amazing! I noticed a bitter aftertaste… it may be normal for those spices but is there something I could add or delete to make it less bitter? Hmmm I’m not sure where that would be coming from…? Maybe the turmeric! I would say next time go less spice, taste and then adjust! I think you could, but you’d want to add them in towards the end so they didn’t get mushy! We have tree but allergies, what can we do in place of almond milk? Regular milk? Thanks, I have the rest of it done and simmering for tonight!! Smells heavenly in here!! Yes that will totally work! I watched the video and made it the same day. One of the best soups I’ve ever made. Thank you so much!! I made the soup for tonight’s dinner. My grandchildren just love it. I added 1 cup of chopped cauliflower. Love it. Just what I needed. Easy to prepare. Nice and comforting-it’s cold outside! Hooray! So glad you enjoyed it!! Just made and ate this soup. Absolutely delicious! Thanks for the recipe. What is the carb grams amount ? I’m hoping all that info will be up soon! Alyssa, I made this for dinner last night. We really liked it! I accidently chopped some carrot too, but added them anyway. The house smelled like Thanksgiving while the veggies sauteed! I wasn’t sure if I would need more liquid, but it was great with the 6 cups. I am constantly trying new recipes, but this one will have to be on repeat. Thanks! I made this for dinner today! I had to sub in rosemary for thyme, and it was just as good! I can’t believe it! I thought that it would clash with the fresh ginger and it didn’t. I also subbed in brown and yellow lentil that’s what I had on hand. I was so good! Thank you again for the recipe. I also want to mention that i’ve been slowly transitioning to a healthier vegan diet and your recipes have decently helped! thank you so much! Please keep them coming! If I’m not serving all of it, should I still add the spinach to the whole pot? Will it reheat ok with the spinach wilted in? Hi! I love your recipes but I have some fairly specific dietary restrictions. Are you able to get the nutrition info up any time soon? Thank you!!! Hoping to get it fixed shortly! Hooray! Can’t wait to hear how it turns out 🙂 and thank you!! Yum! This looks amazing! Also… can’t wait to check out that PB granola and the grain free pizza! Yay!! The granola is coming very soon!